LBC Mini Rack Ovens and Max Rack Ovens are a convenient way to get big oven results in a smaller space. Designed for artisan style breads, delicate pastries, and heavy load cooking, LBC Mini and Max Rack Ovens can outperform convection ovens with the results you expect from our full-size rack ovens. For the demanding baker, performance is most important, and that’s why the LMO combines high steam production with even air-flow to yield baking results that match those of much larger and more expensive ovens. In comparison to convection ovens, the LMO Mini and Max do not require the operator to rotate pans or “pull some early”. These ovens do not have hot spots like some deck ovens. Our Mini and Max Rack Ovens are built to give even baking in a small foot print. 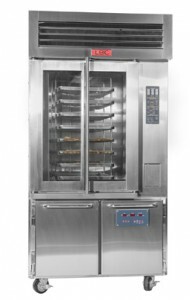 LMO Mini Rack Ovens handle half the load of a full-size single rack oven, while LMO Max Ovens hold 80% of a full-size single rack oven and allow for full rack loading and unloading. Baking, roasting and re-thermalizing are done fastest in an LBC LMO Rack Oven. LMO Mini ovens are slightly larger than a full-size convection oven, yet hold more product. The utility connections are similar to full-size convection ovens too. There are three heights of stand to assure that the oven will fit under a standard hood. LMO Max Ovens have roughly the same foot print of a convection oven, yet they utilize all of the space to the floor, allowing LMO Max Racks to roll into the oven and out for easy and fast loading and unloading. These oven racks are also easy to load and unload single pans. Gas or electric, LMO Ovens cook and bake evenly without manually rotating pans. By utilizing rack rotation and our tri-directional air flow, you get even results time after time. Standard LMO baking oven controls allow for recipe storage of up to 40 recipes. The optional “Bake, Cook and Hold” control maximizes the usefulness of the oven for baking with programmable steam and venting, while also providing a cook and hold feature with a touch of a button, so that roasting times can reach 9 hours and can include pulse steam injection to maximize moisture and product yield. When there isn’t enough space for a full size rack oven, the LMO is the perfect choice. For display baking, the LMO features a full glass, double-pane door, which gives a full view of your product to the customers. With the smaller foot print, it can fit behind a display case line-up to enhance the fresh-baked appeal of display baking. Easy access to steamer components keeps service and maintenance costs very low. Blows air on the baked product from three directions, allowing for precision control of baking and roasting at all levels and across the pan. Bakes a variety of products evenly. Balances bottom and top heat for better product volume. 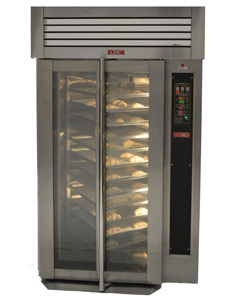 Up to 9 hours roasting and pulse steam injection with optional Bake-Cook and Hold control. Cookies 2 oz. 12 Doz. 16 Doz. 20 Doz. Cookies 2 oz. 16 Doz. 24 Doz. 32Doz.